This year we are pleased to be hosting the Mirus User Conference in our home town of Houston, and Everyone is invited! This conference is the best way to see how Mirus provides a powerful advantage to our clients for building customer satisfaction, increasing sales, and getting to the action plan quicker than is possible with spreadsheets or static reporting. For chain restaurants, the challenge of harnessing the power of the information collected across all of their systems is daunting. Back office and POS systems simply are not engineered to manage all the types of data commonly found in a chain, and the daily cut-and-paste exercise to consolidate the data into spreadsheets is error prone and becomes impossible when the number of systems exceed a handful. At MCON, you will hear first-hand case studies of how Mirus clients operate with an advantage over their competition. Our clients as a group use nearly 100 unique systems to run their companies. 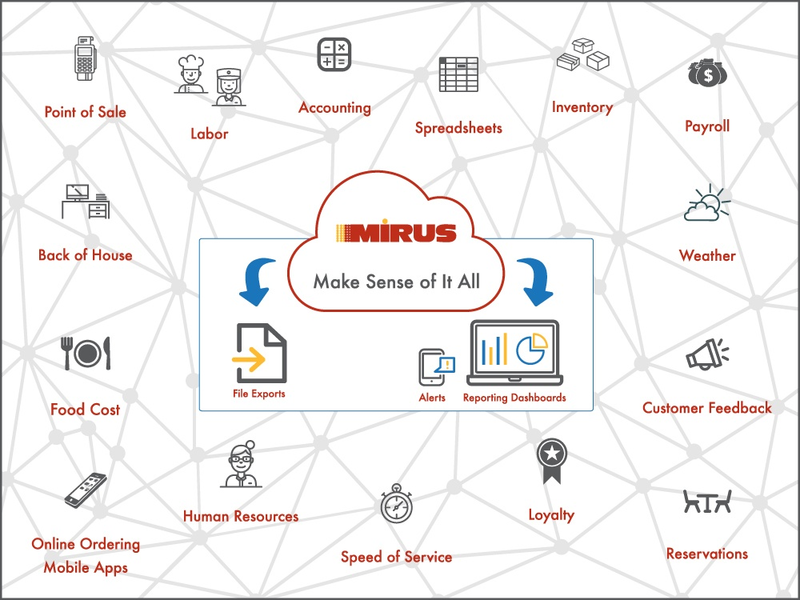 The Mirus platform allows any and all data to be added to the data warehouse. There are no limits to the data, the only limit is your imagination. If you believe there is value in combining data across your systems, MCON is the only conference where you can hear first-person accounts of actual achievements. Even if you are seriously considering building your own data warehouse, you will learn a lot about what your users will expect at MCON. If you currently use any of these systems, and you are in daily Excel-hell, you have a lot to gain by attending MCON. Are you using any vendors in the image above?